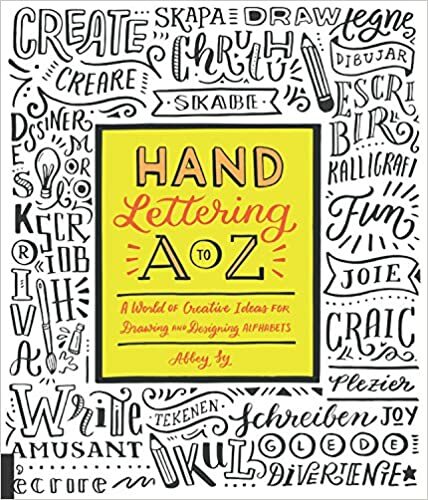 Hand Lettering A to Z is a fun, hands-on book in which artist and calligrapher Abbey Sy presents her creative lettering and invites artists from several countries to contribute alphabets of their own--all unique, all hand drawn. Each alphabet is paired with a collection of phrases to show readers different ways to use the lettering and have fun with it in different languages, including French, Spanish, Irish, Swedish, Portuguese, and more. Readers can use the phrases when making cards, gifts, or embellishing their journals. And unlike calligraphy, hand lettering does not require disciplined study. Hand-drawn lettering is meant to be personal and original, so even beginners can dive in! Cassandra's Review- Filled with creative and beautiful font, this book will really get your handwriting into a new style or creative way to have some fun. Learning new ways to letter will open the door for other artwork and it is great to teach kids as well as anyone that would like a few new tricks.